Scott McKenna was a target for Aston Villa. 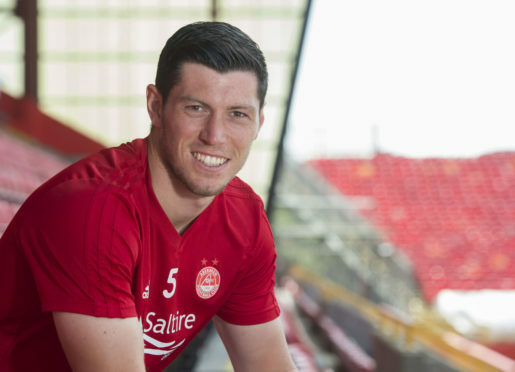 Aberdeen defender Scott McKenna said he understood why the Dons turned down Aston Villa’s deadline day bid for him. The 21-year-old, who could line up for Scotland in Israel this evening, was linked with a reported £6.5 million move to the English Championship club in August. Celtic also had a £3.5 million bid for him rejected. McKenna, who is under contract with the Dons until 2023, said: “There had been offers earlier in the window but I thought they had passed by. “I was injured at the time and I was not expecting anything to happen. Then on deadline day I had been doing some running at the Barracks and when I got back in my car there were some missed calls from my agent. “I phoned him back and he said there had been an offer from another club, Aston Villa. The club decided to knock it back and it is fine. It was the last day of the window so it would have been difficult to get someone else in within that space of time so I completely understand why they did it. McKenna missed Saturday’s 4-1 victory against St Mirren as he served the first of a two-game ban for a challenge on Celtic’s Odsonne Edouard. He will also miss the trip to Tynecastle to face Hearts on October 20. He said: “I am extremely disappointed I am going to miss two games when at the time there was not even a free kick awarded against me. “To get a phone call from the manager a few days later to say that I had been given the ban, it was a shock. I believe I got to the ball clearly before Edouard and I got my foot on it. I am trying to clear the ball or hit it hard enough so if it does hit him he has no chance of controlling it and I think that is what happened. “There was always going to be contact, whether I kicked the ball off him or not.